This is the real Miss Trissie. She was my grandmother and she was born in 1900. In this picture I think she about 15 years old. I love what she is wearing, and although it would seem otherwise she was born in Coventry in the UK. Perhaps this little bodice and shirt was the fashion then. Her name was Emily Beatrice and everyone called her Trissie. Trissie loved to sew and when she was 18 years old she was given a sewing machine for her birthday. 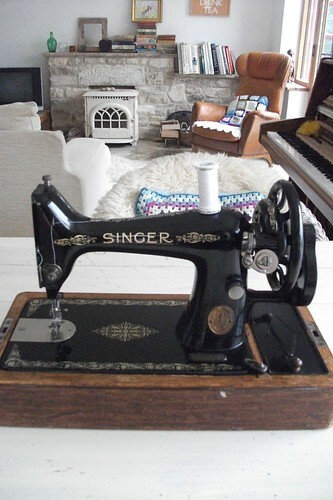 This wonderful Singer sewing machine has been looked after by her, then my Mum and then me and works really well. I love to use it and the sound it makes as it sews. I had it serviced a couple of years ago and it was given a tune up and a clean and it's just like new! Incredible for a machine that must be about 100 years old. I use it all the time when I sew my cushion covers, one day it will be other things, but for now it's cushions. I have called this sewing machine Miss Trissie and I think she would like that. Both Miss Trissie's sit happily with me in my craft room, one by the window and the other on my desk. I do use an electric over-locker, which is a whizz of a thing and a new thing for me. Great for finishing off the seams. One day I would like to try some free-style applique and also work out how to use the different feet that come with it. I must be brave and try them out! Are you using a sewing machine? 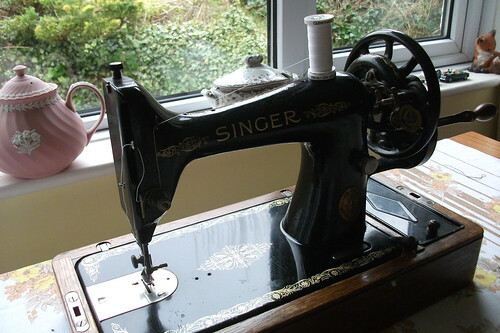 have you ever used an old Singer machine? 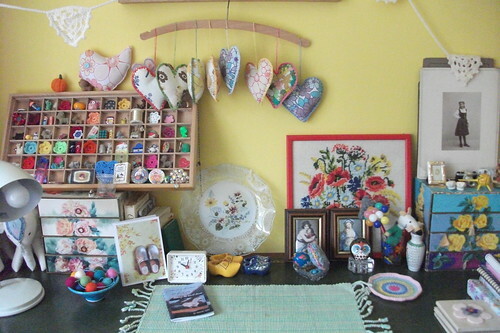 What a lovely story Heather & how lucky are you to have Miss Trissie ♥ Your craft room is gorgeous. I have my husband's grandmothers old sewing table (no machine) in my studio which is really lovely, and use a Brother sewing machine. What a wonderful memory and lovely keepsake. Your grandmother is very beautiful Heather :) I do not have a machine :(( i wish i did, but the house we live in is not big enough and with 2 small kids i do not dare to have one in the open..so as of now, its my wish to own one as soon as i move back to my country! Oh, and i do envy your own craft room that too such a well done, organized and cozy personal space! lovely memory!!!! I remember that I used to play with my gran-granmother's Singer! i have a little sewing machine from John Lewis, but I never use it.....I'm scared!!! Hi Heather, I do have 2 old Singers, on their original Singer tables, but sadly neither of them are in working order. I keep them just because they're so old and beautiful! I would really love to have them restored but in our little corner of the world, there's more change of me falling pregnant!!!! and there's naught change of that!!!! I will take some photo's of them sometime and put them on my blog. I think it's wonderful that you know your Trissie's history and have something useful from way back then, still working today!!! I love both Miss Trissies! Your story reminded me of an old Singer treadle machine that my best friend's mum owned when we were children, and which my friend still uses! I always wanted one of those - one would look just perfect here in the old cottage too! 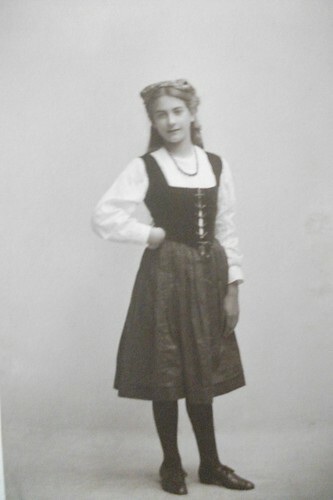 I might write a post about how I wore dirndls as a child, when I was out of school uniform... maybe Miss Trissie knew someone who brought this outfit back from an Alpine trip, as it looks very typical of this area?! Isn't she pretty, looks so confident! On the old photos I have of my German great-aunts at this age they are looking very grim on their confirmation pics. I'm just thinking it was the custom not to smile in photos then wasn't it! What a lovely storey. I have a beautiful singer sewing machine that belonged to my great grandmother. My mother had a machine like that. She got it from her mother. My grandmother used to sew my dresses (the particular fabric patterns and textures I remember well). My mother would curse (well not badly) and yell at the machine and I bet to this day she still says she can't sew. I think because I witnessed that, and because I am rotten at measuring, I do not sew. My mother-in-law was appalled that I did not own a machine, so she bought me one. When I moved abroad, I lent (gave) it to her daughter who is an A-1 seamstress. She was thrilled. My grandmother had a sewing machine just like that one. Pleased to meet both Miss Trissies. That is a wonderful photograph of your grandmother. That sewing machine is wonderful. And that photo! Your grandmother was beautiful. I bet she'd love that you use it now. I will buy a Singer and learn how to sew. I can remember my dear mother and her sewing machine, in the begining without any motor, because we were very poor. She used to sew for an industry of bags, to make ours ends meet... Sweet memories. It's so cool that you use her sewing machine. Hope you have a great day. What a beautiful post! I think both Miss Trissies are very pretty! I've been hankering after a similar Singer for a while now. I have a Singer too although it is 'only' twenty five years old and not as attractive as your loyal companion. What a lovely story. I love looking at old photos, it's like taking a peek into the past. What a beauty. (both of the Trissies) How very cool to be able to sew on the same machine as your foremothers. My machine is about 30 years old, and was top of the line when I bought it. Maybe one day my granddaughter will own it. What a nice thought.